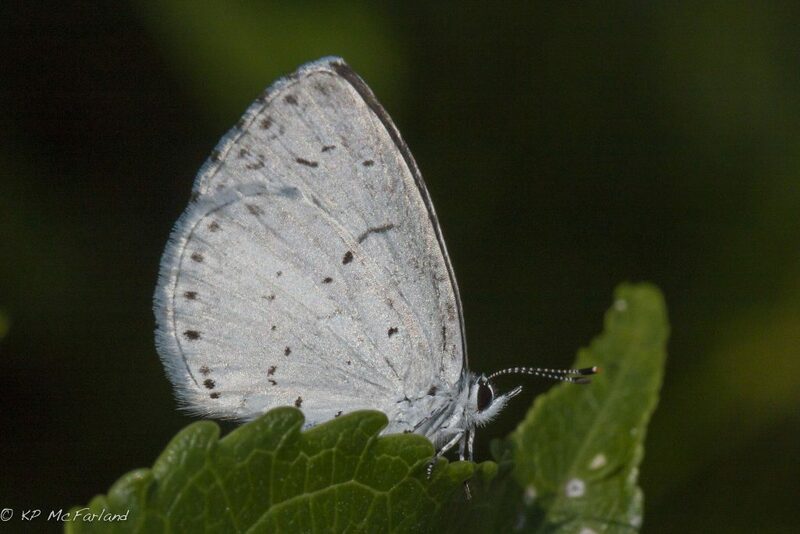 Although they measure barely an inch across, the azures (in the genus Celastrina) cause a mile of consternation among lepidopterists. Even as these butterflies present sparks of blue, their taxonomy remains cloudy and controversial. I won’t resolve it for you here. Instead, I’ll tell you some of what we know or suspect about these blues, including revelations from recent research in Canada. Along the way, you’ll discover how butterflies can expand our knowledge of nature, and maybe even allow you to witness evolution happening in your own backyard. The first thing to remember is that butterflies — perhaps more so than birds and other flying things — are very much creatures of their environment. Their bond with plants is one of the great alliances in evolution. A Monarch gets its toxins from the milkweed it ate as a caterpillar, for example, and a Bog Copper lays her eggs only on cranberry leaves because that is all her caterpillars can eat. No milkweed or cranberries? No Monarchs or Bog Coppers. Or, as a butterfly might see it: I eat, therefore I am. Most butterfly caterpillars are picky eaters like this, some relying on a diet of a single host plant — and nothing else. For the most part, it produces order for us among butterflies: distinct, recognizable species eating their own particular plants. Not so the azures. They’re a beautiful mess. 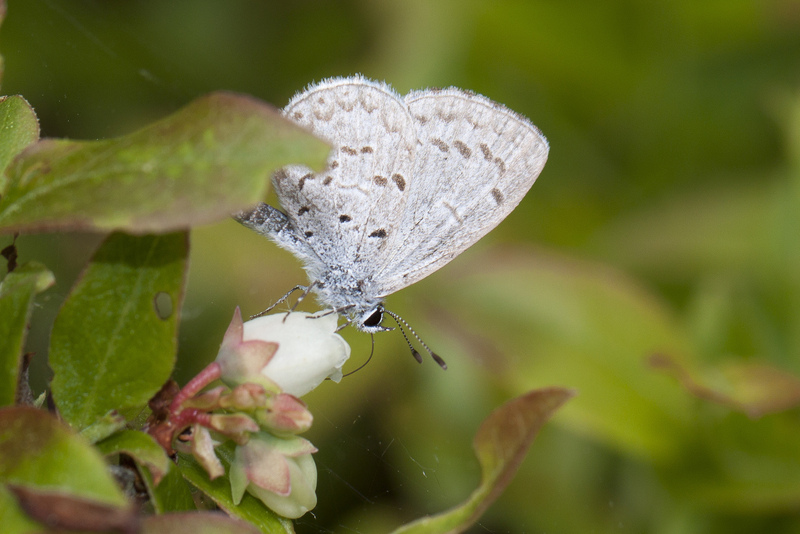 The little 1 blue butterfly too often known simply as “Spring Azure” has been a moving target with multiple identities for at least three decades. In the field, we recognize among azures a complex of three or more distinct varieties — or phenotypes. They differ mostly in the dark spots and 2 blotches on the underside of the hindwing. This is not the random variation of a Dalmatian, for example, but rather distinctive forms with specific patterns of spots and blotches or varying shades of blue above. This kind of variation actually isn’t so odd in nature. Many species break into regional or continental subspecies whose appearance varies somewhat by location: Savannah Sparrows breeding on the island of Cape Sable, Nova Scotia, and wintering on dunes and beaches of the East coast, are paler (more sand colored) than all the other Savannah Sparrows breeding in grasslands across the continent. White-tailed Deer on Long Pine Key in Florida are the size of German shepherds — still a legitimate White-tailed Deer, mind you, but only smaller: a “mini-me” adapted to vanish (and survive) behind waist-high shrubs. So it goes, evolution by means of natural selection, also driving diversity within a species. What’s odd about our Spring Azure is that its varied forms basically cohabitate — we often find them together in the same places at the same time of year (or pretty close to the same time). They’re sympatric, which means “of the same fatherland.” This is somewhat odd (and one of the reasons I’m writing about azures).